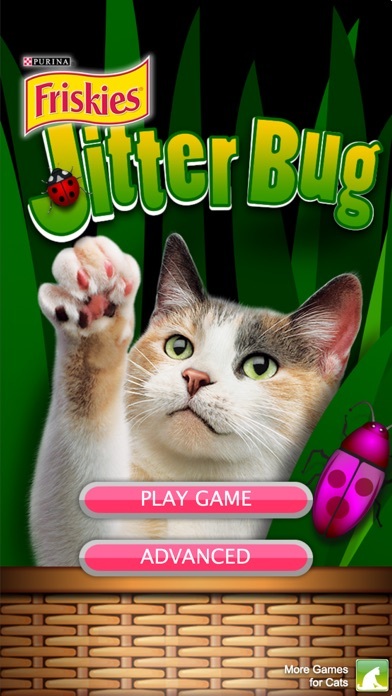 With Friskies® JitterBug your cat can practice catching little bugs anytime right on your iPhone or iPad. 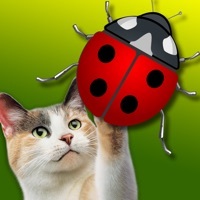 In Game mode, there are five fifteen-second rounds to catch as many bugs as possible, and then you can share your cat's score on Facebook. 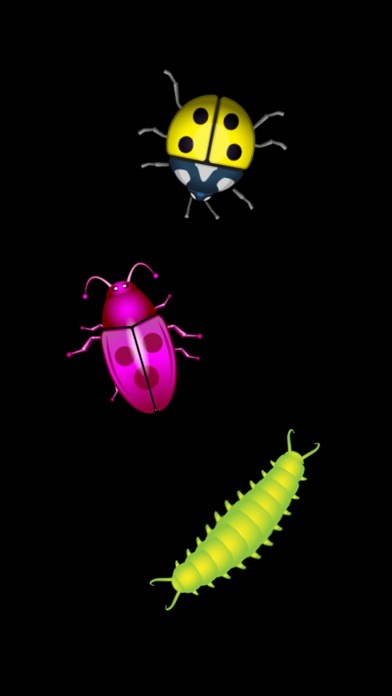 There's also an Advanced Mode where you can select how many of each kind of bug will appear. Advanced mode also features an Endless Play option, so your cat can practice as long as she likes. To exit Endless Play mode, simply shake the iPhone or iPad, and it will return to the main menu. Don't forget to always reward your cat for playing Friskies® JitterBug! I am a tech specialist for a public school. I downloaded the app after I saw a post on Facebook of students playing it in gym class. The teacher uses the app, airplays it to a computer attached to a projector. The images are projected on the wall. Students try to hit the wall bugs with a ball. 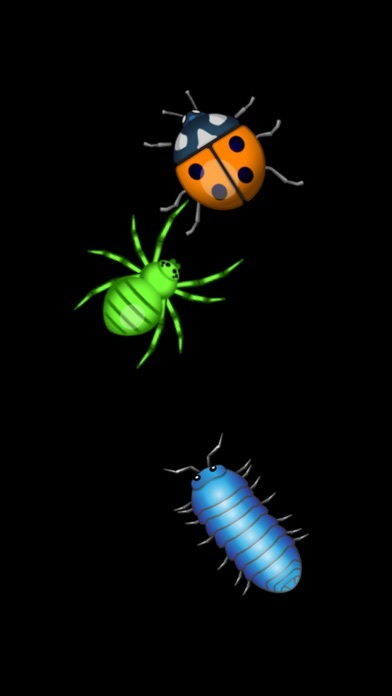 As they do the teacher zaps the bug on their phone/iPad making it seem the students are getting the bugs. An illusion but how fun for the students! I downloaded this app to help my bearded dragon rebuild her motor skills.She came from a bad home (temporarily paralyzed back legs from falling, crippled tail and hip dysplasia from malnutrition.) She is super interested in the little bugs crawling around and tracks them with her head. It’s funny to see her tilt her head back and fourth. This game has helped her learn how to eat wax worms again, as the digital bugs make great practice for bug catching. She’ll dart her tongue at it and continue to observe the bugs. Now that she’s gotten better at catching them with her mouth, I can now put the real bugs far from her and she’ll run enthusiastically over to them! My cats go crazy with this app. Only drawback is now they always attack my phone lol If the app isn’t interesting your cat it’s not the app’s fault. My foster kittens liked it but the bugs need to be MUCH smaller and move faster. I put it in front of both cats I have and neither tapped the screen. All they did was stare at it. If u can read then read this, DO NOT GET!! All the haters on here need to get a life. Pits funny to watch my cat touch the screen but after a few minutes she lost interest but it was still really cool to watch! I haven't played yet, but if your cat doesn't want to play, respect his/her space, when your cat wants to play, they'll let you know. Keep in mind that cats often prefer to be alone, so they probably won't want to play at first. My cat tapped the bugs with its nose but it didn't work he just didn't even care for the bugs maybe he's scared of the bugs they are the size of his phone paw! he couldn't eat my phone, therefore it was of no interest. Both my cats seem to enjoy watching the bugs. It's funny to see that they have a type they prefer to watch. They only seem to pay attention at nite tho. Maybe they have to be calm enough to just stare at the screen? As other reviewers have mentioned, cat just stares for a second and then turns away. Maybe the bugs should be smaller and faster. There is no sound using iPad. I put in front of her and she goes and gets one of her toys. The games a joke!😞makes me mad! The cat hated it. And he loves everything. Lots of fun, but kitty bit and gouged iPad screen trying to eat the bugs! My cats take no interest. And I have 4! Neither one of cats even notice this. The movements aren't realistic enough and the bugs are too cartoony. This would be better for a baby to play. Only one of my cats showed any interest and then quickly lost interest in the game. I think lack of sound is the major problem.